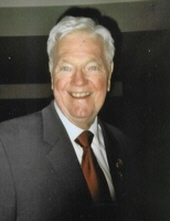 Robert H. McCann, Sr., Age 94, Ret. Det. C.P.D. and U.S. Army Veteran of WWII. Beloved husband of the late Anna Mae (nee Jenen). Loving father of Anna Marie (Mark C.P.D.) Morrissey, Robert H. Jr., CCSD (Barbara), Emma (Greg) Degen, Rose (Tom) Burke, Janet McCann, C.P.D., Thomas (Megan), and Roger (Carol) McCann. Dear great grandpa of 33. Devoted brother of Barbara Martin, Emma Dearth, and the late Frank McCann, Allen McCann, Neal McCann, Ken McCann, Koral Kettering, and Raymond McCann. Uncle of many nieces and nephews. Member of Chicago South Elks Lodge # 1596, and the American Legion. Retired Detective 36 years with Chicago Police Department. Alumnus of St. Leo Grammar School (1939), and Leo H.S. (1943). Visitation Sunday 2-8pm at Curley Funeral Home (Heeney-Laughlin Directors), 6116 W. 111th St., Chicago Ridge, IL 60415. Family and friends will meet at St. Cajetan Church, 11200 S. Artesian Ave., Chicago, IL 60655 on Monday morning for Mass of Christian Burial at 10:00am. Memorials to Honor Flight Chicago, 9701 W Higgins Road, Suite 310, Rosemont, IL 60018 or Misericordia, 6300 N. Ridge Ave., Chicago, IL 60660 are most appreciated. To send flowers or a remembrance gift to the family of Robert H. McCann, please visit our Tribute Store. "Email Address" would like to share the life celebration of Robert H. McCann. Click on the "link" to go to share a favorite memory or leave a condolence message for the family.